Combine the sugar, ½ cherries, ½ cranberries and the water in a saucepan, bring to the boil then reduce to a simmer for 10-15 minutes (stir constantly). Add the remainder of the fruit and cook another 3-5 minutes, but these berries should not be soft, I wanted some of them more solid. 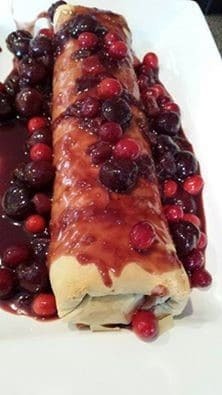 Note: Next time I will spread a layer of mascarpone cheese on the filo and then top with berry mixture before I roll into a strudel.